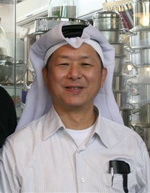 Dr. Yang and Nick Yang traveled to Qatar during December 2007 to teach at Aspire, the world's largest indoor sports dome. Dr. Yang has traveled to teach there before, and long-term plans are underway for Dr. Yang to establish a Chinese martial arts training center in Qatar, so his knowledge and the YMAA curriculum are available to the Middle East. Dr. Yang's seminars were small but successful, with interested and motivated students, which further inspired him to try to provide a learning center in that region. During this one week tour, Dr. Yang and Nick also gave martial arts demonstrations at the American Embassy for the American and British Ambassadors, and at Aspire. The British ambassador, Mr. Roddy Drummond, expressed strong interest in inviting Dr. Yang and Nick back for a seminar in April 2008. At that time, Dr. Yang will again meet with supportive Qatar society members and government officials to continue work toward a world-class YMAA training center there. YMAA author Arthur Rosenfeld has been interviewed by NBC in the story "Customers In Starbucks Drive-through Pay For Drivers Behind Them". Rosenfeld, the trend starter, says it wasn't originally an act of kindness but a change of consciousness. "The guy behind me was angry. I changed a negative to a positive." Employees at the South Florida Starbucks say customers in the drive-through have been paying for drivers behind them all day ever since. Master Yang's Qigong seminar and visit to Chile, from the 4th until the 11th of December, was amazing! He presented general Qigong theory and also the Four Seasons Qigong theory and exercises. 70 people attended the seminar, located at Campus "Casona de Las Condes" of Andres Bello University, with the cooperation of the Faculty of Kinesiology. Master Yang's visit was a real blessing for Chile. He has been to Chile before, and has many people who enjoy learning from him. He is able to feel at home here, especially because of the natural beauty of the land.We brought him to visit the South, which is very similar to the Northern California climate and landscape, but is completely undeveloped and still wild. The active volcanoes, spring waters, perfect landscape, amazing forest, glaciers, and waterfalls really impressed him and Nick Yang, who also came. For Chilean students, this was an unequaled chance to learn directly from Master Yang; the extraordinary series of Four Seasons Qigong and understand better the depth of Qigong theory. We are so grateful for his visit and we hope he can come back soon, hopefully with Nick and other members of the YMAA family. The Winter 2008 Seminars scheduled between Jan 29 and Feb 24, 2008 with Dr. Yang, Jwing-Ming is expecting full attendance. Many people have pre-registered and the attendance looks very promising, from beginners to International School Directors and senior students from Portugal, Spain, South Africa, UK, Ireland, France, and others. Subjects include Shaolin and Taiji Chin Na, Yang Style Taijiquan Form and Fighting Set, Taiji Pushing Hands, Qigong Level 1, Qigong Level 2, and Taiji Ball Qigong. YMAA has a history of forging ahead in uncharted terrain. When it was popular to publish books and videos about Tai Chi and Chi Kung in the 1980s, YMAA Publications instead began offering titles about Taijiquan and Qigong, because it has always been a primary mission of Dr. Yang and everyone at YMAA Publications to educate the reader above all else. The lesser known hanyu pinyin translation of Chinese is more accurate and less widely known, and therefore sales at first were slow. Over time, people began to understand and YMAA Publications has become well known as a source of detailed and authentic information about the traditional arts. In the same way, YMAA Publications is pushing forward with Martial Arts Literary Fiction. There is a long history in China for Martial Fiction, dating back to The Three Kingdoms by Luo Guan Zhong in the 14th century. In the West, only a few authors have worked to keep this tradition alive. Martial arts are sometimes used in stories and film for excitement and shock value, but rarely is the inner world of the martial artist portrayed deeply. YMAA is proud to be bringing the best of these authors into the fold, and to be bringing martial fiction to the mainstream. The first two hardcover editions, The Cutting Season and The Crocodile and the Crane, are available now as a holiday gift item with a limited-time 40% discount. Dr Yang has been just about everywhere. He has some serious frequent flyer miles. For 25 years he has traveled for months every year around the world teaching in seminars, and in the networks of YMAA International Schools, which has grown to 60 schools in 18 countries, including Iran. He recently began teaching elsewhere in the Middle East, after being invited to teach Qigong, Tai Chi, Meditation, Chin Na, and Gongfu in Egypt and Qatar. In December 2007, Dr. Yang and Nick Yang are teaching in Qatar at Aspire, the world's largest indoor sports dome. Aspire formally hosted the 2006 Asian Games, and is a contender as a future host for the Olympics. Qatar is a small, sovereign country that is leading the way in the Middle East in many ways, including entrepreneurship and liberalization. 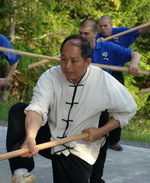 Dr. Yang has been invited there as the sole source of their study of the traditional Chinese martial arts. While there, they will also meet with high ranking members of Qatar society in order to forge a long term alliance and establish a dedicated training center for the ongoing study of the arts. Next Summer, Dr. Yang will begin the next major chapter of his life with the YMAA California Retreat Center. A small number of guest students will be accepted to join the disciples of the ten-year Retreat Center training program in training from September to June each year. The training will be challenging and you will learn at an accelerated rate, and will achieve higher levels of skill and understanding in a much shorter period of training. There are strict rules and a schedule which must be adhered to in order to maintain the code of discipline that is an integral aspect of the training at the Retreat Center. In addition, the first-ever Summer Seminars will be offered at Center, between July 11 and August 21, 2008. The Center, which is located on 240 acres of mountain side land in the heart of redwood country, is a beautiful setting that allows you to relax deeply, reconnect with nature, and become immersed in your study. Subjects will include Chin Na, Taiji, Pushing Hands, and Qigong. 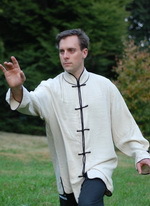 For years, YMAA has produced the raw silk uniform for kung fu and tai chi. This traditional uniform was initially less popular than the shiny silk usually seen in demonstrations, but it has gradually become one of the best-selling uniforms available. YMAA Silks became the uniform of many schools worldwide. During the 1990's the use of raw silk in clothing declined rapidly and it became near impossible to get this raw silk fabric. Raw silk is recycled during the production of polished silk, and fewer people have continued this practice, which resulted in a gradual decline in quality. Fewer and fewer manufacturers in China were capable of working with the material, so it became more difficult for YMAA to maintain the quality of these popular uniforms. Ultimately, YMAA Publications made the decision to partner with a clothing manufacturer and design a new kind of unpolished silk that would allow us to maintain the quality that martial artists have come to expect. The new 'herringbone' silk has been received with rave reviews. The fit is more accurate to standard sizing, the cut is more generous, and above all, the fabric is soft and extremely durable.